I often get ask about the Azure Stack roadmap and when new services, features and improvements will be integrated into Microsoft Azure Stack. Microsoft just released some new official update on the Azure roadmap page. We are working on increasing the maximum number of nodes in a scale unit to 16 so that Azure Stack operators can configure a larger Azure Stack deployment. This entry applies primarily to an Azure Stack operator. We’re developing the ability for Azure Stack operators to backup and recover guest OS, data disks, and volumes using Azure Backup. When complete, this new ability will give operators more options when developing a backup strategy for Azure Stack. New and updated features are being developed to help Azure Stack operators determine if their Azure Stack integrated system has been tampered with, enhancing the Azure Stack security posture. Additionally, they will be able to remediate if configuration has drifted. Azure Stack operators will be happy to hear that new and updated features are being developed to ensure Azure Stack integrated systems are “hardened by default,” meaning that since the infrastructure runs on well-defined hardware and software, we enable, configure, and validate security features that are usually left to customers to implement. This work will also include updates to the audit collection logs to better integrate with SIEM systems. Managed Kubernetes with Azure Container Service (AKS) on Azure Stack will make it even easier for Azure Stack users to manage and operate Kubernetes environments in the same ways as they do in Azure, without sacrificing portability. This new service features an Azure-hosted control plane, automated upgrades, self-healing, easy scaling, and a simple user experience for both developers and cluster operators. With Container Service, customers get the benefit of open source Kubernetes without complexity and operational overhead. This update applies primarily to Azure Stack users. This work in development will bring support for templated Kubernetes clusters. This will simplify deployment and operations for Azure Stack users by allowing them to deploy the template to Azure or Azure Stack, thereby providing a consistent environment in each cloud. This update applies primarily to Azure Stack users. This work in development will bring templated Service Fabric clusters that will simplify deployment and operations for Azure Stack users. Once deployed, Azure Stack users will be able to manage Service Fabric clusters, applications, and services through PowerShell, the Service Fabric CLI, or the open source Service Fabric Explorer just as you can in Azure. This update applies primarily to Azure Stack users. With this work in development, Azure Stack operators will have more site recovery options by be able to take advantage of Azure Site Recovery to replicate and failover guest OS and data disks to Azure. This entry applies primarily to an Azure Stack operator. We’re developing enhancements for Azure Stack that will simplify infrastructure backup by eliminating the need for manual operator intervention. These enhancements will include the enablement of operator-driven validation of cloud recovery. This post applies primarily to Azure Stack operators. Azure Managed Disks simplifies disk management for Azure VMs by managing the storage accounts associated with the VM disks. You only have to specify the type (Premium or Standard) and the size of disk you need, and Azure creates and manages the disk for you. This work will bring more options and simplicity to Azure Stack users when working with VMs. This update applies primarily to Azure Stack users. We’re working on bringing Av2-series and F-series virtual machines (VM) to Azure Stack so that users can create them when building and deploying applications. Av2 is popular for development and test scenarios, while the F-series provides more cores with lesser memory requirement than the D-series. Learn more about Azure VM sizes and Azure Stack Virtual Machines. We’re expanding support for the VPN Gateway to allow Azure Stack users greater flexibility with their settings. Once available, this will allow users to configure their own settings so that they can establish a VPN tunnel with the older devices they have in their datacenter, without requiring them to upgrade these devices. We’re working on bringing the 2017-04-17 version of the Azure Storage API to use in Azure Stack. When ready, this will enable Azure Stack users to perform URL-to-URL copies, simplifying the movement of data between Azure and Azure Stack. 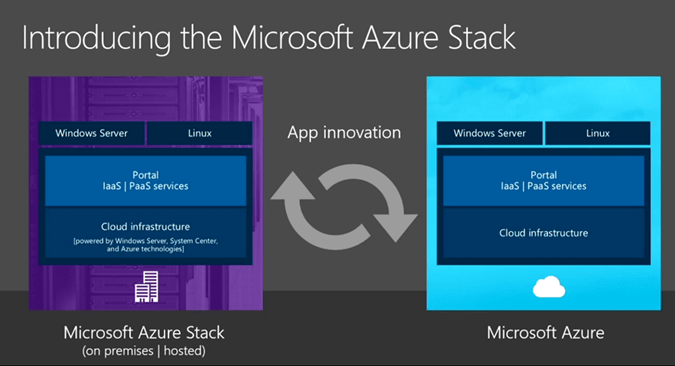 This update applies primarily to Azure Stack users, but will be beneficial to any user looking to create hybrid applications that span Azure and Azure Stack. We’re now working on adding the ability for Azure Stack operators to add a node to an existing Azure Stack scale unit within the supported scale unit limits. This will enable Azure Stack operators to increase the capacity of a single Azure Stack, and specifics should be discussed with hardware partners. For customers who want larger Azure Stack integrated systems, we’re working on adding support to have multiple scale units in an Azure Stack integrated system. This applies primarily to Azure Stack operators, and will enable them to increase the capacity of a single Azure Stack. Azure Stack operators can configure Azure Stack and manage offers, plans, services, quotas, and pricing to provide resources for their users. Azure Stack operators also manage capacity and can respond to alerts. We’re developing new and updated features for the monitoring, diagnostics, and servicing experiences to ensure Azure Stack operators can keep the Azure Stack integrated system running and healthy. These include:Investments in infrastructure servicing to minimize tenant downtime. Improved alerting and remediations to allow the operator to maintain system health. Updated diagnostics for better troubleshooting. Continued investments in the Operator UX and Operator PowerShell. We’re creating documentation to describe how Azure Stack infrastructure satisfies regulatory technical controls for PCI-DSS and CSA-CCM. Azure Stack operators will be able to use this documentation to simplify the processes that companies go through when working with governing bodies. Check back for more information as the documentation is developed. Work is currently in development to allow Azure Stack operators the ability to configure the virtual machine pricing and display it in the Azure Stack portal. This will provide additional flexibility when creating plans, offers, and managing subscriptions. Check back with this blog to see developments as work progresses, and get more information.